The MultiMix 3 hand mixer easily whips, kneads, blends and chops food in a conveinient and safe way. Intuitively all attachments are fastened to the front that allows for the same comfortable hand position to be maintained no matter which attachment is used, and the EasyClick function ensures that you can conveniently switch the whisking and mixing tools by pressing the large button once. Due to the SmartMix function, the weight is directed into the bowl and not in your hands, when the motor is placed directly over the attachments. The hand mixer has variable speed for you to adjust from low to turbo with a flick of the thumb for better control and efficiency in preparing food - with any attachment! The non-slip soft grip handle ensures a steady, cushy and secure grip even at the highest speed, and the patented PowerBell hand blending techonology gives you fine and even results - every time. 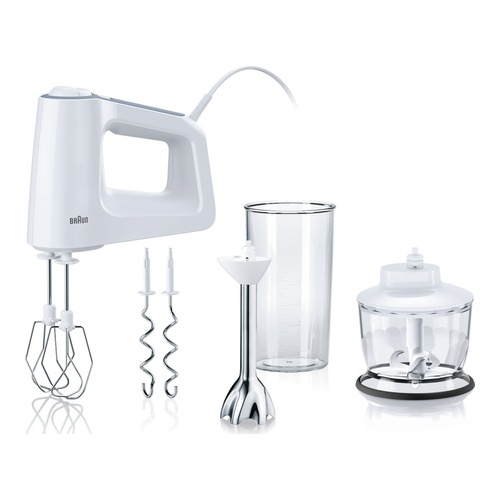 The hand mixer is perfect for whipping, beating and stiring eggs and cream, mixing cakes, muffins and home-made desserts. The dough hooks are perfectly suited for kneading, making shortbreads and pasteries. It perfectly blends smooth shakes, prepares ice creams or fillings for cakes, and it even chops nuts, dried fruits, chocolate, spices and carrots in seconds. The MultiMix 3 hand mixer easily whips, kneads, blends and chops food in a conveinient and safe way. It is equipped with patented PowerBell technology for fine and even results and the anti-splash design ensures a spotless kitchen. It comes with 2 whisks, 2 hooks, an anti-splash blending shaft, a 600ml beaker and a 500ml chopper.